Hummingbird Moth - Insect or Bird? Q: I had a very strange bug (?) visiting my yard. It looks like a cross between a moth and a hummingbird. Q: I have a Meyers lemon tree full of blooms and this little guy went flying by my head, not shy at all, having a ball. Saw a picture someone sent in on Facebook to you. Can you give me information on this little bird? Never saw one before now and what a treat for me to see. It's actually a very pretty moth. Description: Beautiful moths that look like hummingbirds. Wingspan 1 1/2-2" (38-50 mm). Wings initially plum-red to brownish black, but scales drop off after 1st flight, leaving clear areas devoid of scales, except along veins. 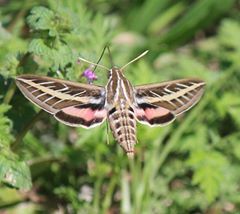 The body is spindle-shaped, mostly olive-green with plum-red bands across abdomen and rear tufts. Caterpillar is yellowish green with darker green lines and reddish-brown spots on abdomen and with yellow tail horn. Life Cycle: Caterpillar feeds on foliage of plants of the honeysuckle family and others. Habitat: Forest edges, meadows, and cultivated flower gardens. Range: Coast to coast in the North; also east of the Great Plains south to the Gulf. 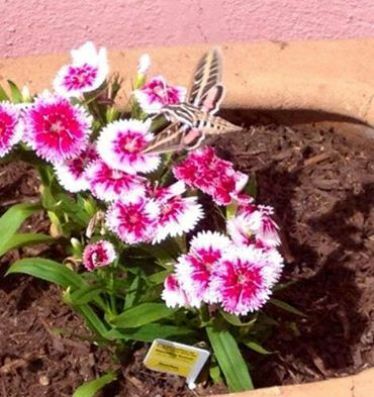 Discussion: This moth hovers over flowers in full sunlight, producing a buzz with its wings similar to but softer than that of a hummingbird similarly engaged. There are two generations a year. Life History: Adults fly during the day, and hover at flowers to sip nectar. Caterpillars pupate in cocoons spun at the soil surface. Flight: Two broods in the south from March - June and August - October, one brood in the north from April - August. Adult food: Nectar from a wide variety of plants including Japanese honeysuckle, beebalm, red clover, lilac, phlox, snowberry, cranberry, blueberry, vetch, and thistles.